BSNL announced extension offer on fixed monthly charge (FMC) plan under Wimax Broadband Services as promotional basis. India’s most trusted telecom brand Bharat Sanchar Nigam Limied (BSNL) has extended the Wimax Broadband plan WI 399 earlier announced in Punjab Telecom Circle now available upto 31-0-2013. 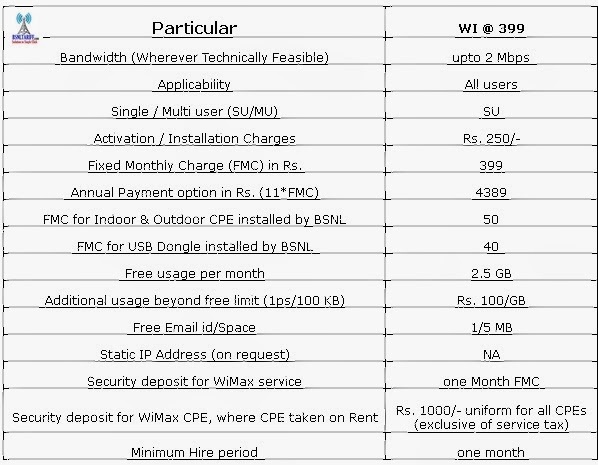 Under this FMC plan Rs.399/- bandwidth offered upto 2Mbps for Single users. Activation/Installation charges collected Rs.250/- per connection. Customer have payment options monthly Rs.399/- and annual Rs.4389/- (11 months) by following terms and conditions. Free data usage 2.5GB per month and additional usage charges beyond free limit 1ps/100KB (Rs.100 per GB). The above promotional offer will be applicable in Punjab Telecom Circle and available upto 31-03-2014.